Here’s yet another impressive Ibanez electro-acoustic offering from the Japanese brand’s Artwood series – the AW54CE. This dark beauty combines performance with affordability, and a touch of premium thrown in for good measure. This premium comes in the form of some impressive components and a solid top – for an acoustic guitar under $300 there’s a lot on offer. Let’s find out what to expect. This gorgeous AW54CE features a classic dreadnought shaped body with a single cutaway and a 25.6” scale length. Just glance at the dark brown body and it’s quickly apparent that this is an all-mahogany model. As you may expect, the back and sides are laminated, but it features a solid mahogany top – a quality addition at this affordable price point. The entire body has an open pore finish, which adds to the rustic aesthetics of the guitar, although doesn’t make much difference to the sound. 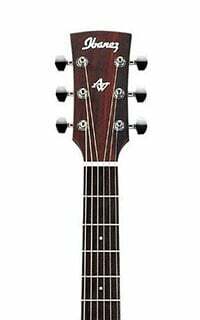 The neck, which joins the body at the 14th fret, keeps the mahogany theme going, although features a classic rosewood fretboard, with 20 frets and simple dot inlays. Thankfully, for performance, the neck enjoys a hand-friendly satin finish, so is ultra smooth to get up and down. With an attractive tortoiseshell pickguard, this is ultimately a simple but very stylish guitar, with great vintage appeal. Aside from good looks, the AW54CE is loaded with tech that benefits both tone and performance. For example, the Ibanez AEQ210TF preamp along with a Fishman Sonicore pickup (this system can vary from marketplace to marketplace). The AEQ210TF system features a 2-band EQ, comprising volume, bass, and treble, as well as an on-board tuner – all battery powered. Perhaps not the most versatile system, as mids need to be tended to via the amp, but it gives you some control over your tone. At the headstock are six chrome die-cast Grover tuners, along with a bone nut and matching bone saddle on the rosewood bridge. This bridge is also home to Ibanez Advantage bridge pins, which make string changes easier and hold the strings in place correctly, for good consistency. Finally the AW54CE comes fitted with D’Addario EXP strings as standard. 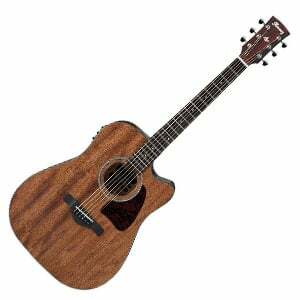 Unplugged, this model has a lovely rich tone. With the dreadnought body and the solid mahogany top, there’s plenty of resonance and natural projection of offer. The all-mahogany construction makes for a warm, slightly dark tone, but the X-bracing keeps things articulate. Playing through an amp with the pickup system is a fine experience, although the slightly limited controls means versatility suffers a little. Still, for the price, the overall sound is very good. For under $300, Ibanez’s AW54CE really impresses. The dark vintage looks are something no guitarist would pass up, while the satin-finished neck allows for a good performance. A solid mahogany top, quality tuners, simple electronics, and a full tone combine for a very applaudable instrument, no matter what your skill level. For more info about the Ibanez AW54CE, click here. Amazing guitar for the price. Makes me want to play it every time i look at it. Very beautiful to look at.